I love pasta salad. Really, I just love pasta. I could never be gluten-free. It’s just not me. I’m not happy without some sort of pasta on a regular basis. I do admit pasta isn’t always the best food, but I fully believe in everything in moderation and in making things healthier as much as possible. So one of my solutions is to add a ton of vitamins and fiber when possible. That’s how this salad came about. I do a summer camp most summers and I started making this during then; a time when I have a limited time to eat and need something to fuel me for the rest of the day with tiny children. It is also one of the most ridiculously simple pasta salads in the world. It takes about five minutes longer than it does to cook pasta and it can easily stay in the fridge for a week. Because of that. I usually make a lot of it at once and keep it for a week of lunches. It’s also so easy to modify. You can change the pasta shape, not cut the pepperoni slices like I did and use bocconcini or cilliegine mozzarella (the little balls) instead of the big ball of mozzarella like I did. In fact I usually use cilliegine mozzarella just to cut down on the amount of chopping I need to do, but I couldn’t find it in my store today so I went with the big ball. You could also bump up the fiber and protein count more by substituting a whole grain or fiber rich pasta. Cook ziti (Or other short cut pasta) in boiling salted water according to package directions. Drain pasta. 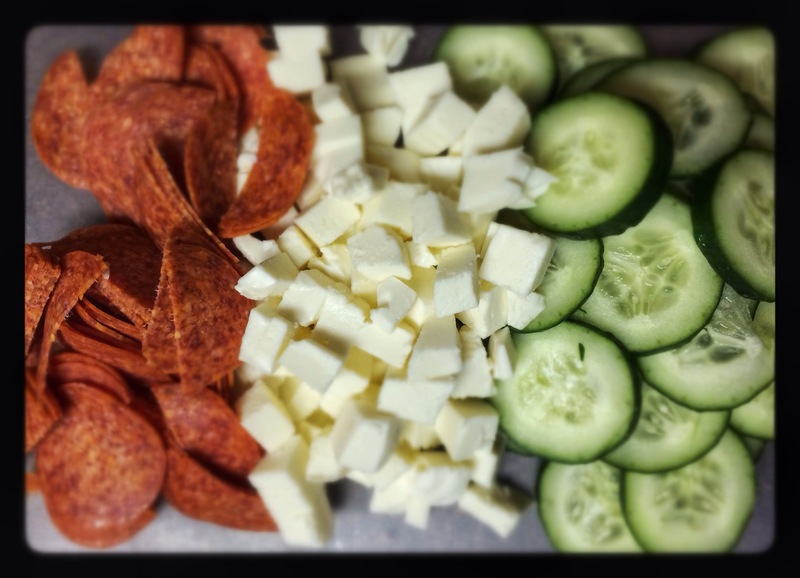 While the pasta is cooking, slice the cucumbers, halve the pepperonis, cut mozzarella and drain garbanzos. Once the pasta is drained, transfer to a large bowl and allow to cool slightly. 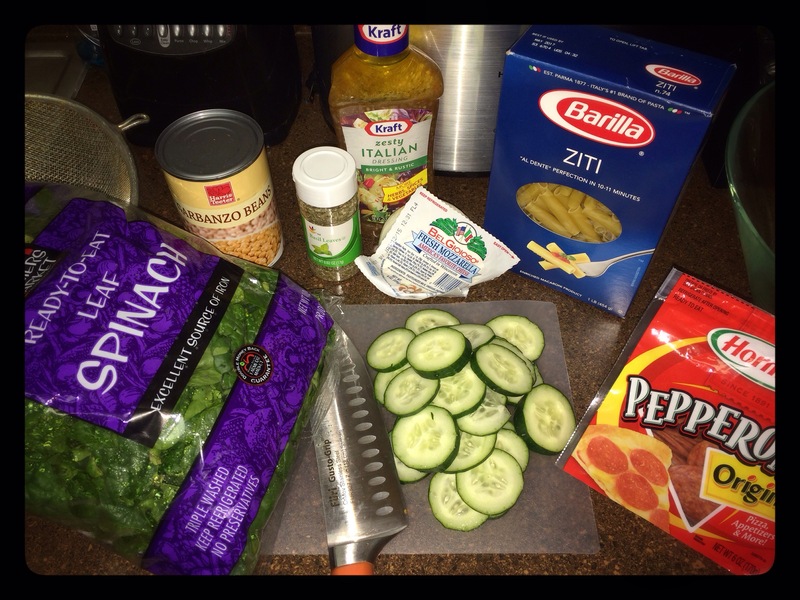 Mix the pasta and the salad dressing. Add bagged spinach and toss well. 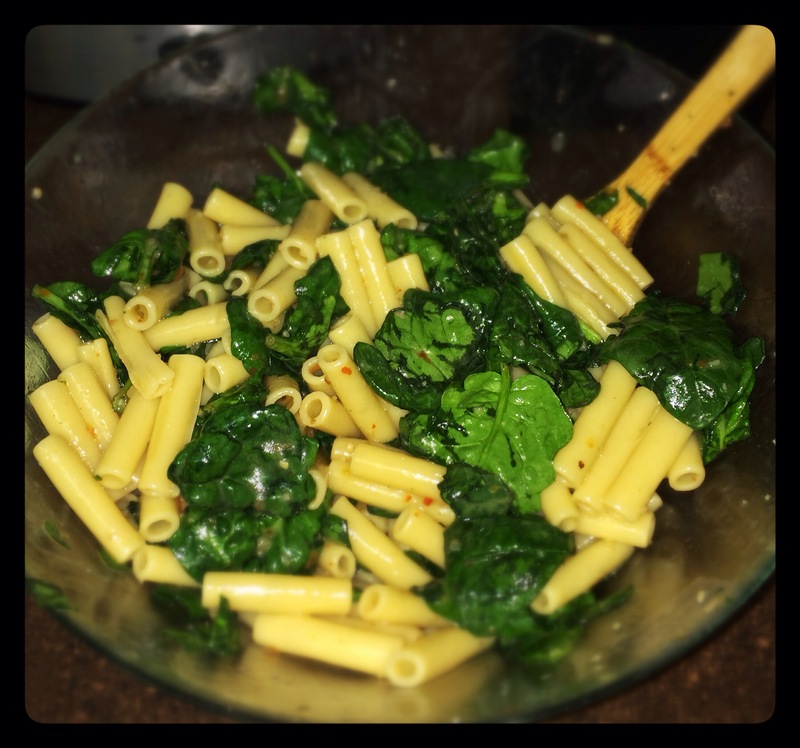 It is really important to take a couple minutes to toss the spinach and the pasta really well. 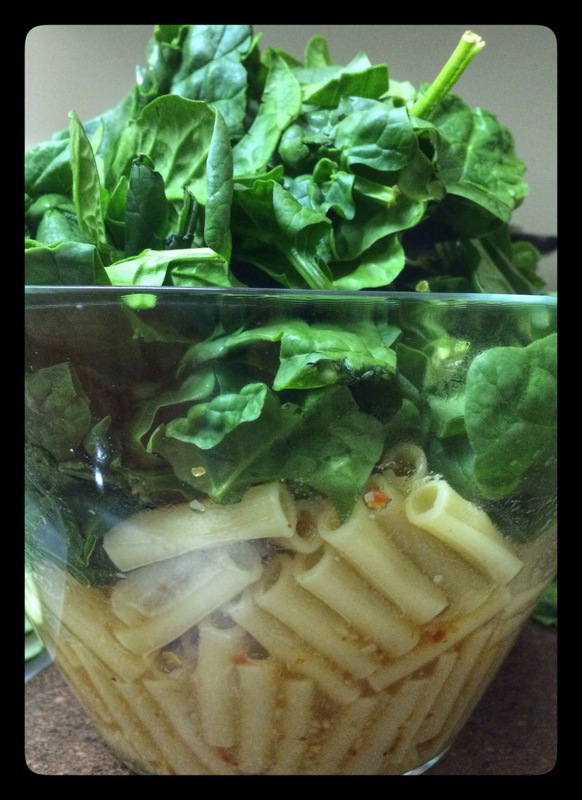 You want the residual heat from the pasta and the dressing to wilt the spinach a bit. The huge pile of spinach you put in should wilt down to about half it’s original mass if you give it proper attention here. 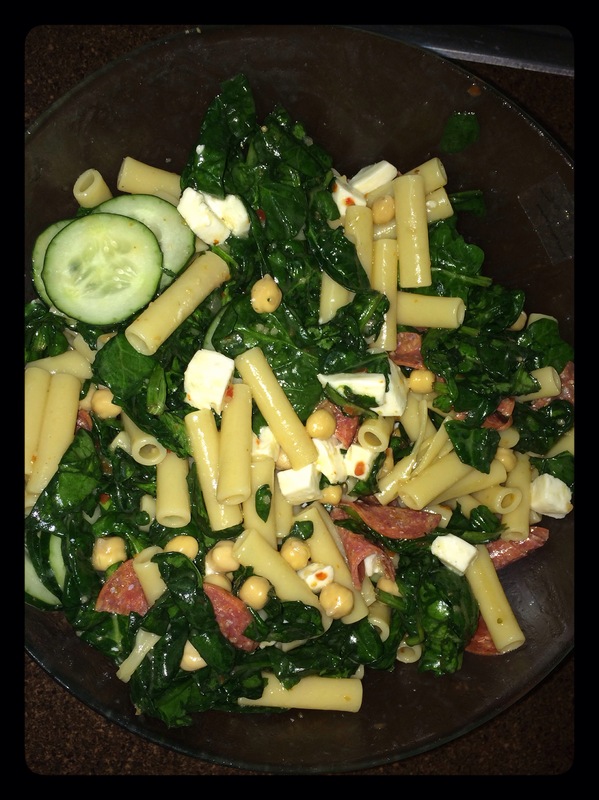 Once the spinach is wilted, add the garbanzos, pepperoni, cucumbers, and dried basil. Toss well to combine. Once all ingredients are mixed, then I add the mozzarella. I add it last mainly just to ensure that the pasta has cooled enough from the mixing that the fresh mozzarella won’t begin to melt. Then you can eat immediately or cover with plastic wrap and store in the refrigerator for up to a week. I can’t reach the remote…. I love pasta too. And salads. So of course I love pasta salads. I had to go on an elimination diet two years ago, which meant no gluten, and it was the longest three months ever, I swear. I’m sure gluten free pasta has improved since then, but it was definitely NOT good then! 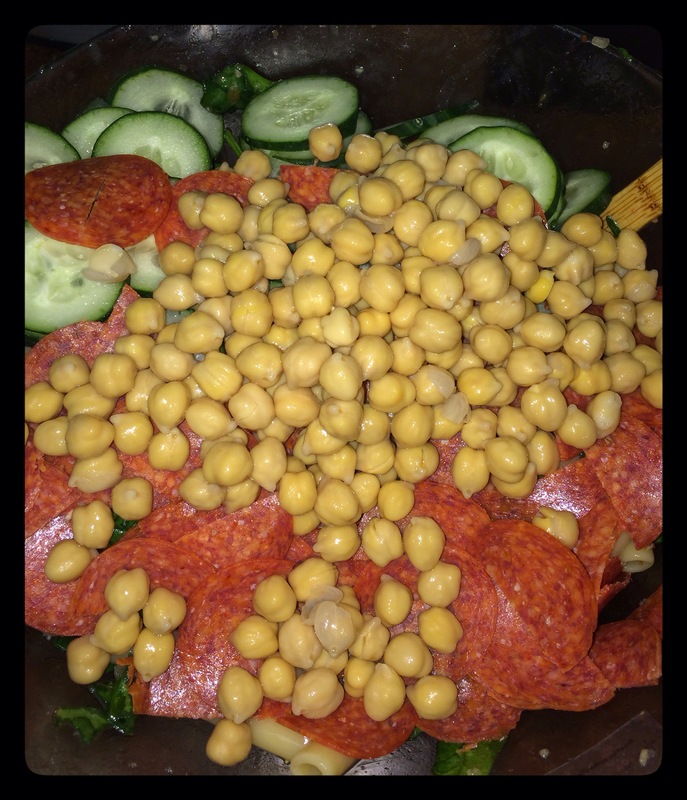 I love that you put pepperoni in this salad. I wouldn’t have thought to do that. Visiting from That Friday Blog Hop.